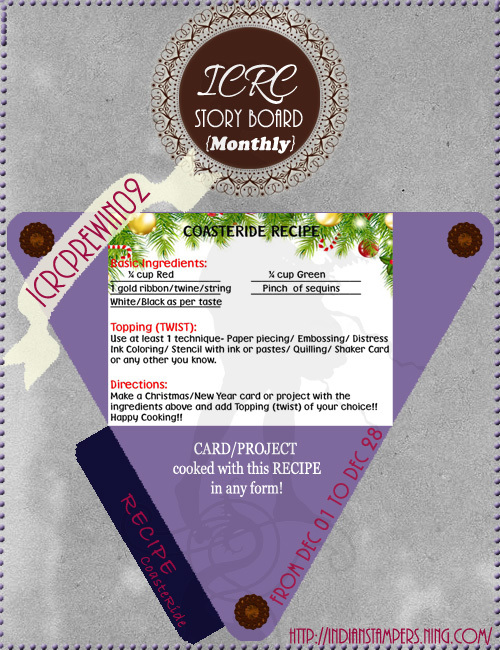 Paru's Perceptions: Indian Craft Room Recepie challenge! There is still time to play the Indian Craft room recipie challenge and win some awesome prizes from the Craftshop! 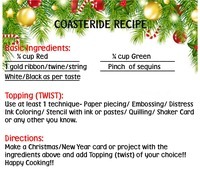 To play you have to look at the recipie given below and create a Christmas or new year card or project. Here is my second dose of inspiration for all you crafters out there! To make this card, I used patterned paper from the Doodlebug Design Inc. 6"x6" paper pack. I cut an embossed the white wreath using a Cuttlebug die and embossing folder. 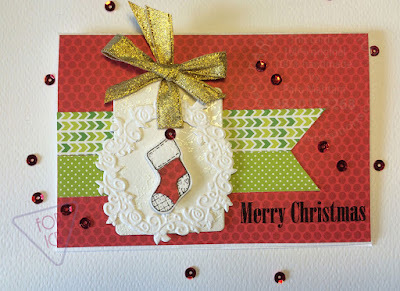 The tag was cut using an MFT die and heat embossed with snowflakes from an Inkadinkado stamp set. The stocking was cut from patterned paper and paper pieced with white card stock. I added some gold ribbon and sequins to finish off the card. The sentiment was stamped in black and heat embossed with clear embossing powder ( a trick I learned from Jennifer Mcguire). I hope you feel inspired to create! You can find a lot more inspiration from our DT here on the Indian Craft room page.